The move comes as part of new CEO Scott Thompson’s strategy to narrow the company’s focus and boost its profit. 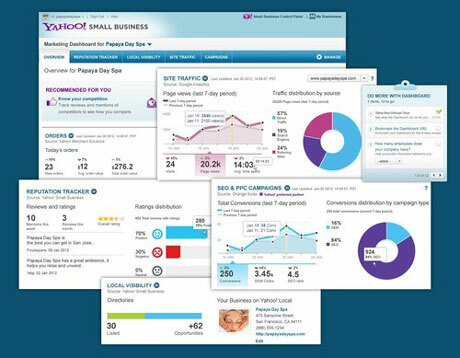 Yahoo’s dashboard tracks search listings in local search results and on platforms including Yelp, flagging listings that don’t include the business in question, for example. It also pulls information from social networks and other sources to show businesses what’s being said about them around the Web. “The goal is to help small businesses manage their online marketing, but also to help them discover new marketing opportunities,” said Shannon Parker Hane, director of product marketing at Yahoo’s small business unit. “It’s certainly going to help boost [Yahoo’s] SMB revenue,” he said. Also on Wednesday, Yahoo issued a letter to shareholders urging them to vote for its slate of board candidates rather than the alternative slate put forth by activist shareholder Daniel Loeb, who leads the hedge fund Third Point LLC, which owns more than 5 percent of Yahoo’s outstanding shares. “[W]e believe that, based on the specific qualifications of Third Point’s nominees relative to Yahoo!’s business and opportunities, the candidates nominated by the board’s Nominating and Governance Committee are significantly superior to those proposed by Third Point,” the letter said.